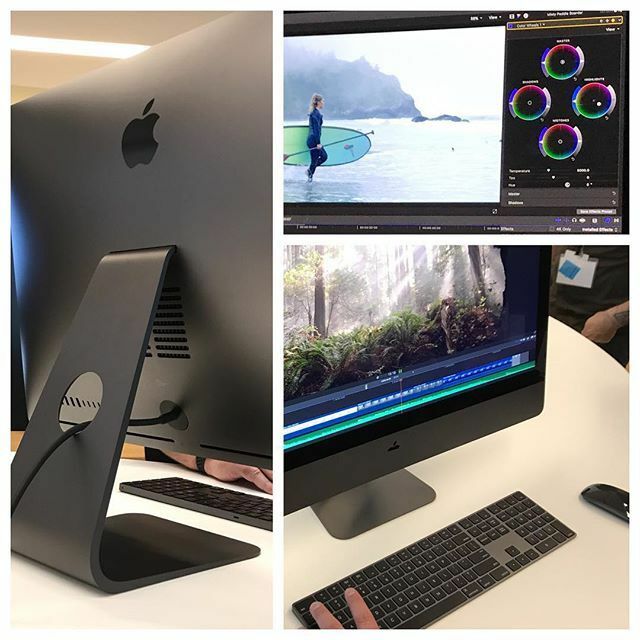 Apple set up an iMac Pro at the third annual FCPX Creative Summit in Cupertino, California over the weekend, providing attendees with a closer look at the powerful workstation ahead of its December launch. 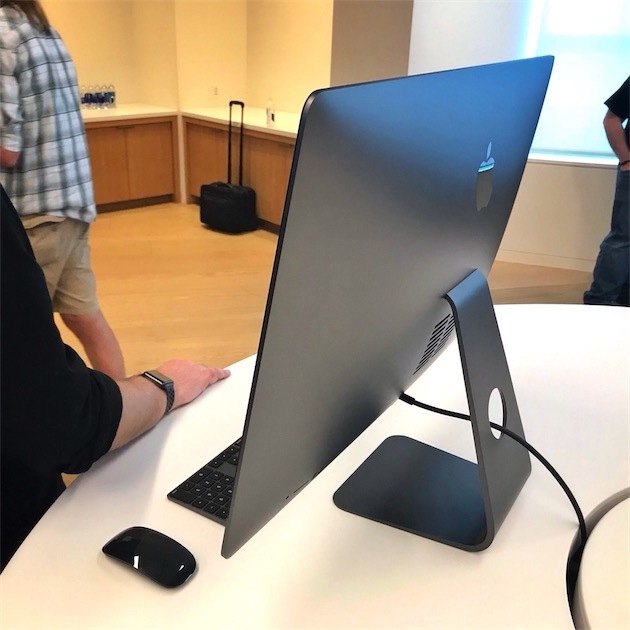 Apple appears to have allowed attendees to take pictures of the iMac Pro at the event. French blog MacGeneration rounded up some of the photos shared on social platforms like Instagram and Twitter. 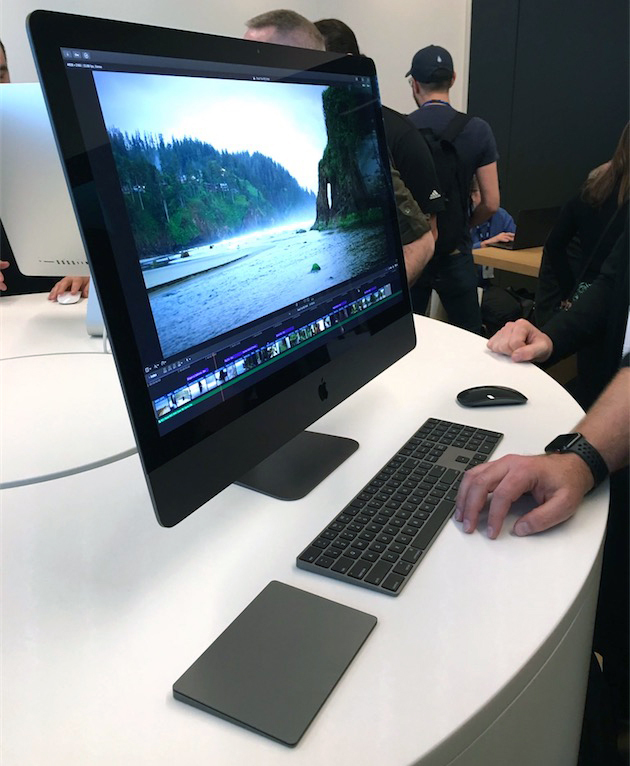 iMac Pro shares the same design as the standard iMac, but with an all-flash architecture, a new thermal design, and four Thunderbolt 3 ports. It's also distinguished by its sleek, exclusive Space Gray enclosure. The all-in-one computer is bundled with matching Space Gray accessories, including the Magic Mouse 2, Magic Trackpad 2, and a wireless Magic Keyboard with Numeric Keypad introduced at WWDC 2017 in June. Apple said the iMac Pro will also feature up to an 18-core Intel Xeon processor, top-of-the-line Radeon Pro Vega graphics, up to 4TB of SSD storage, and up to 128GB of ECC RAM, with a starting price of $4,999 in the United States. The FCPX Creative Summit, hosted by Future Media Concepts, featured three days of training on Apple's professional video editing software Final Cut Pro X. Apple itself announced that Final Cut Pro X 10.4 will launch later this year. Final Cut Pro X 10.4 will include new color tools, like color wheels and a white balance picker. It will include support for HEVC, the new video format introduced in iOS 11 and macOS High Sierra, and direct import of iOS for iMovie timelines. The new version of the software will also support VR and HDR workflows. I don't understand this machine, at all. Zero upgradeability, literally none. I can (barely) understand this mentality in a MacBook Pro as you want to have it thin and light, but what's the reason you cannot even upgrade the RAM in this? Add a back panel, let us add more ram and an additional stick of NVMe storage. I wish Apple would sell the space gray accessories so I could have ones that match my MacBook. Nice machine, but for this day and age - it's insane. Take my g*dmn money!.. NOW! I don't understand this machine, at all. Zero upgradeability, literally none. I can (barely) understand this mentality in a MacBook Pro as you want to have it thin an light, but what's the reason you cannot even upgrade the RAM in this? Add a back panel, let us add more ram and an additional stick of NVMe storage. Couldn't agree more. Unbelievable if you can't upgrade at least the RAM. Especially with Apple's bananas RAM prices. no matter what you call it and put in it. It is still an Imac that is difficult or almost impossible to upgrade. Apple proved that there is 5 year cycle and after there is no support for that device. 1000 euro per year (standard config) is ridiculous for normal people or small medium company. Interestingly Apple shows off Final Cut pro. Of course because there is nothing else. They killed Aperture entire Ilife experience was redesigned and features removed. I just wonder how quiet it is when GPU runs full power. SSD 1 TB is no go. What else is there? PS: I have Upgraded Mac PRO from 2006. Who can beat this? Apple has completely missed the boat for pro users once again. I don't know one professional that wants a computer with a built in display. We use very specific displays in our various industries, whether it's video, audio, 3D, etc. We also need to be able to swap out drives, upgrade RAM, etc. when necessary. Buying some all-in-one iMac on steroids for a huge amount of money is asinine. Stop trying "new things" and just go back to the tower we all knew and loved, and put some beefier components inside. Otherwise, we'll all keep sticking to our upgraded 2010 Mac Pro machines that are now rivaling the initial Geekbench scores of this new iMac Pro. In order to increase the cooling, did they take away user-replaceable RAM??? This does not make any sense. Let's say you have a team with 5 iMac Pros with medium specs, which actually puts the machine in the $10k range. Each. That's $50k worth of equipment that you have to replace (resell preferably) if you happen to need more RAM or more powerful graphics. Not very efficient financially speaking. If you're pro team, you'd want your investment to last a bit longer, not throw away the entire computer just because you run out or RAM or the CPU is not performing as you need it to. Disagree. Let’s say I have an employee I pay $50K a year (graphics/animation or similar field). I buy an iMac Pro for $10K and plan on keeping it for only 2 years. So that iMac Pro increases my costs for that employee by 10%. Do you think an employee on a brand new workstation will see their productivity rise by only 10%? Especially when compared to using a machine that’s already 2 years old? How about the reduced chance of missed deadlines due to increased performance and productivity? How do you even put a price on that? You could easily justify buying this machine and throwing it in the garbage every 2 years and you’ll still come out ahead. And this doesn’t even take into account the tax write off your business would get when you buy the machine. If you make money off content creation or a related field, then this machine is easily a sound financial investment.